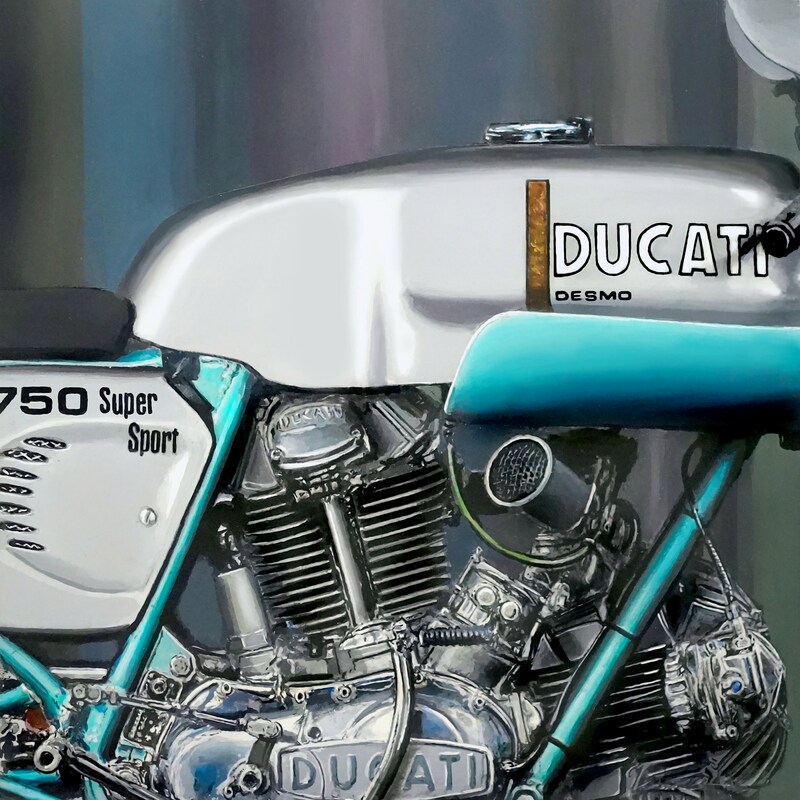 The original acrylic-on-wood panel painting of Ducati's 750SS was created as a tribute to the legendary beauty and significance of Ducati's entrance into the modern era of motorcycling. As the editors at Italy's Motociclismo wrote, "To say that the SuperSport 750 was one of the most beautiful sportbikes ever made is no exaggeration; it may be considered among the most significant motorcycles of all time." High praise for a production bike that went racing, scored a shock victory and changed the fortunes of an Italian motorcycle company previously known only for its sporting sub-350cc singles, if at all. Ironically, winning rider Paul Smart had only reluctantly agreed to race the new Ducati 750 at the inaugural Imola 200 road race (interestingly enough, Paul's wife pressured him into racing it). He was not overly impressed by the converted roadster as it sat in the paddock, nor during his first practice laps. All that changed when he arrived back in the pits to much fanfare and cheering to learn that he had just smashed Imola's lap record. The handling and torque were so smooth that the feedback through the bike belied its actual performance. Smart and fellow 750SS rider Bruno Spaggiari went on to a smashing 1-2 finish at the Imola 200 (Europe's equivalent of Daytona), which immediately elevated Ducati from a company known for "quaintly individual" motorcycles and into the superbike market. 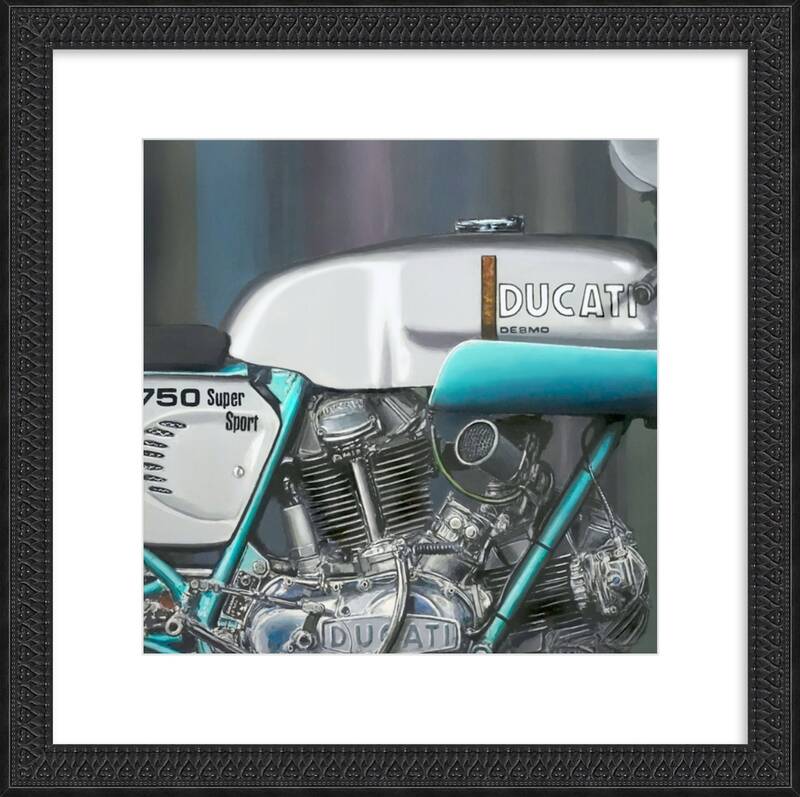 Prints individually produced by the artist utilizing professional imaging technologies and methods. As a result of meticulous standards, each print retains a beautiful painterly quality that preserves minute and subtle tints, blends and detail of the artist's original painting. The meticulous reproduction process and the use of archival pigments and museum-quality canvas produce a stunning piece that collectors and admirers often mistake for an original. *Prints ship in a heavy-duty shipping tube.